DiZ walks through the abanndoned mansion awaiting the arival of his new companion. He looks at the dirty empty surroundings and thinks about all he has lost to his old apprentice. He becomes angery and kicks a near by table. "He will pay for this..."
"Ahh you have arrived...you now Roxas I'm sure you've met." He says with a serious look on his face. "Yeah we've met...about a year ago." He says turning to the blonde haired nobody. "Sup." "So...he's in on it too?" saying to DiZ. Before stepping closer to come face to face with his mysterious gaurdian angel. "Actually yes he is...he can prove useful." DiZ says looking towrads Roxas. "You do know dont you? 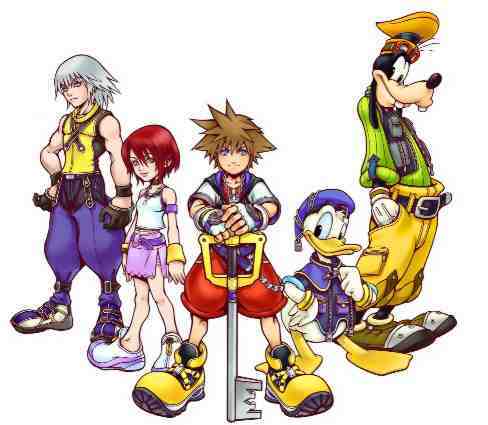 I plan on overthrowing the organiztion and wiping out any trace of Kingdom Hearts." "Now, now. Don't do anything foolish." Axel walks around a corner and stands next to Roxas, "if he does i got his back anyway"(drawing his weapons)"you mess with him you mess with me as well"..
Daimos watches the four talk, fading in and out of the shadows around them. "So...that is DiZ...hmmm....and they must be from the Organization...." he whispers quietly while still fading in and out. "Theres someone else here. "i say to Roxas.I then form a black hole and tell Roxas"we should go", i then jump through the black hole and leave it to let Roxas through. The portal suddenly closes and a man in a black organization robe walks out of the shadows. "Roxas stays." The man sais as he pulls out his Dark Abyss keyblade. "Let the man finish Roxas! Now...DiZ...what is your plan to wipe out Kingdom Hearts?" "Thank you...", DiZ looks towards Roxas. "You don't want to destroy the worlds? You don't want to see everyone perish? Why let Xemnas have the oppurtunity to destroy what you want alive? And if you were to refuse..."
Relix takes out his keyblade smilig. "...we'd have to use force. Will you cooperate? ", looks towards Roxas and his two partners who look like they won't take no for an answer. "What will it be?" He sees that Roxas betraying his "friends" would be no option and denying two keyblade wielders wouldn't be smart either. "I give you a day to think this over. Tomorow at midnight...i want your answer...i hope you will make the right choice. ", DiZ then walks towards the basement but turns back. "And if you were not to show up..."
"...we will drag you out ourselves." Relix then follows his new partner to the basement. "Relix, Riku follow me. ", he then points to a room. "There you can have conversations with our other acomplice...the witch...but enough of that nobody. We must prepare our plans. Oh and Relix...that keyblade won't do we're going to have to get you another one. I'll see if I can get acsess to the keyblade graveyard. You'll find plenty there." "A new keyblade? ", RElix says almost in discust. "This was my very first, i have a bond with this one. In the keyblde gravyard you may use anyone there you find. It comes at a cost." He looks towards Riku. "You should know am I right Ansem?" "Interesting...it seems to be a quarrel among the ranks...I'll have to follow them to find out more information..." Daimos whispers to himself while hidden in the darkness. He changes into a cloud of dark mist and quickly wisps after DiZ and Relix into the basement, being seen only briefly by Roxas and Riku.